Subcontracted R&D work is an area that frequently causes confusion for companies wanting to claim R&D tax credits. Companies that hire external parties to help them carry out R&D project often don’t have clarity on how to include those external costs correctly in their claims. And companies that are hired to carry out the eligible R&D work, want to know whether they or the hiring company hold the right to make an R&D tax credits claim for that project. There are a few scenarios to consider and, in this article, we’ll be clarifying the rules that apply to each. Firstly, the two different types of R&D tax credit schemes (the SME and RDEC schemes) each have their own set of rules governing subcontracted R&D projects. Under the more generous SME scheme, the contractor (i.e. 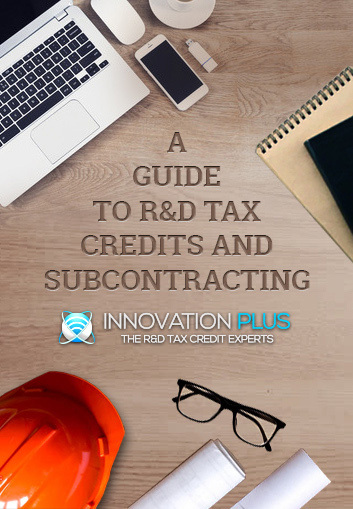 the company paying for the subcontracted R&D work) has the right to claim R&D tax credits rather than the subcontractor carrying out the work. The contractor can include 65% of their subcontractor costs in their claim as eligible R&D expenditure – if the work being delivered qualifies for the scheme. However, in certain cases, the right to claim the R&D tax credits will be held by the subcontractor, because it is not R&D that is being subcontracted, for example, if it is a contract to provide a service or a commercial product. The general principle to determine whether or not R&D is being subcontracted is that the fact pattern of the commercial arrangement needs to be examined, starting with any contract between the parties if one exists. While a contract, if one exists, may not be conclusive, there may be certain indicators which will point to whether or not it is subcontracted R&D. It is, of course, better to consider these points at the outset of the commercial arrangement than in retrospect, and to ensure that a written contract reflects the desired intent. While these are not conclusive, taken together, they form a fact pattern which potentially can take precedence over what is written in a contract. Agreeing to pay specifically for the subcontract of R&D rather than for a generic purchase of goods or services is the strongest pointer of subcontracted R&D. In the context of the contractor/subcontractor relationship, the company that is taking on the financial risk of the R&D work will usually be seen to be carrying out the R&D. In other words, a project is likely to be considered as subcontracted R&D if there is an agreement for the subcontractor to be paid regardless of the project’s outcome. In subcontracted R&D work, it is expected that the subcontractor will have a significant amount of autonomy in carrying out the assigned work, deciding how (and possibly where) it should be performed with little, if any, supervision. In subcontracted R&D work, the usual expectation is that the subcontractor would be providing specific deliverables. The company that retains ownership over the resulting IP of an R&D project is usually seen as the one carrying out the R&D, though there can be exceptions to this. Under the RDEC scheme for non-SMEs, you cannot include subcontracted R&D work in your claim at all. However, this also means that if you are an SME company and R&D work has been subcontracted to you, you can claim for the work you have done under the RDEC scheme. However, since the benefit paid out to companies under the SME scheme is typically 24.7% of the total eligible expenditure (and 33.35% for loss-making companies) while the benefit of the RDEC scheme is only 9.72% of your total eligible expenditure, it’s preferable to claim under the SME scheme if possible. We hope that we have managed to shed some light on this topic. Innovation Plus helps companies to structure their R&D partnerships in an optimal way that helps them get maximum benefit from the R&D tax credits scheme. If you need assistance in this area, please contact us for obligation-free advice.